Afia Choudhury, an inspiration for us all. Afia Choudhury, one of our parents and governors, has won a prestigious national Fostering Network’s President’s Award for her excellent contribution to fostering. Afia’s success story has been picked by the national media and the newscaster and journalist Martin Bashir made a film about her. She has appeared on the BBC One Show, BBC news, ITV Live and the Asian network. 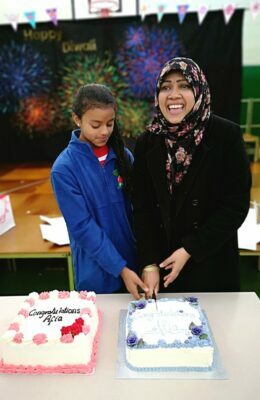 On Monday 12th November we held a surprise party for her in Campbell hall at 3.30pm. it was a wonderfully collaboration between the staff and parents of Elmhurst, catering for the event. 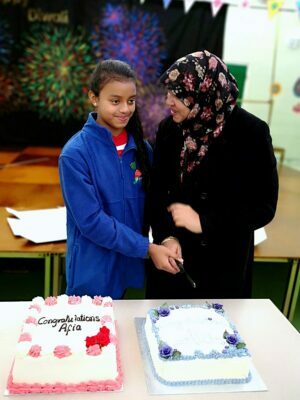 It is always worth celebrating people in a community who go the extra mile to improve the life chances of more disadvantaged children and certainly our Afia is one of these people who is also a trailblazer. Next >> Next post: Reception stay and play sessions.